Fall officially arrived a week ago, but mother nature seems to want to hold on to summer. Regardless of the temperatures outside, the trees know what season it really is, and right now it's apple picking time. Some of the best tasting apples and the best baking apples are just starting to come into their prime. That means Fresh Apple Cake (Apfel Kuchen) as seen in the picture to the right. 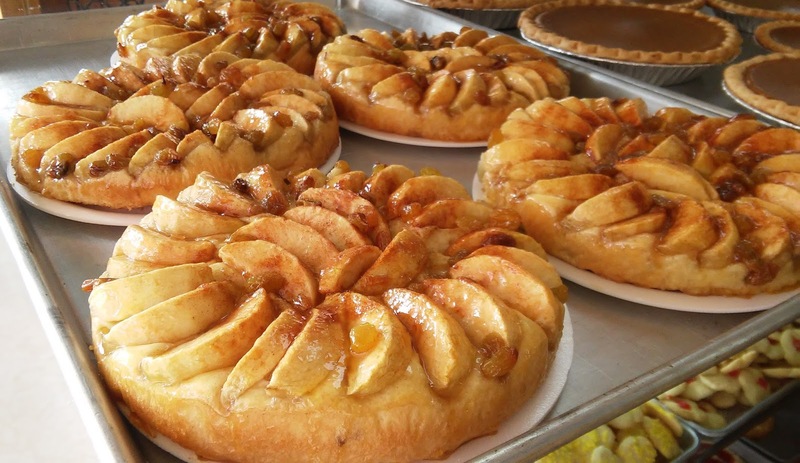 It also means old-fashioned baked Green-Apple Pies, fresh dipped Caramel Apples, Jewish Apple Cake, and of course our Apple Strudel. "An apple a day keeps the doctor away", maybe not so much when in a pie or covered in caramel but it's all how you look at things, and from our view...apple season looks pretty delicious!